With thanks to the author Kay Sexton who allowed us to take this from her latest book “The Allotment Diaries”. There is a review of her previous book “Minding my peas and cucumbers” here, and a review of “The Allotment Diaries” is coming soon. Take the bottle and cut roughly in half, ensuring that the base half is slightly taller than the top (cap) half. Drill a hole in the lid, big enough to take a doubled cotton-rich string about 40cm long – I have seen it said that you can do this with a hammer and screwdriver. Don’t! You will damage the screwdriver and possibly yourself. If you don’t have a drill, use an oven glove to hold a skewer in a gas flame until it is hot enough to melt plastic and then poke it through the lid (don’t use the skewer on the barbecue afterwards). 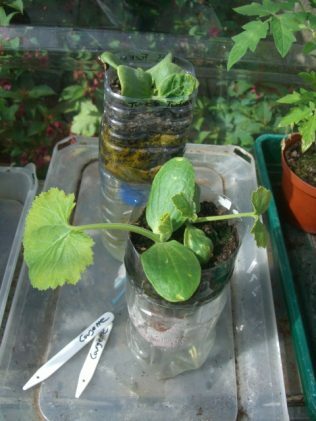 Label the top half of the bottle by turning it so the lid is down and writing on the upper edge what the propagator is going to contain. Double the string over and make a knot in it so there is a couple of inches of loop above the knot. Insert the string into the hole in the lid so that the knot sits inside the lid with the loop above and the loose ends hanging below. Now fill the upper half of the bottle with soil, pulling the loop of string to the centre so that it runs up through the compost. Place the bottom half of the bottle underneath and half fill with water. The loose ends of the string should drape into the water. Sow two seeds into the soil. 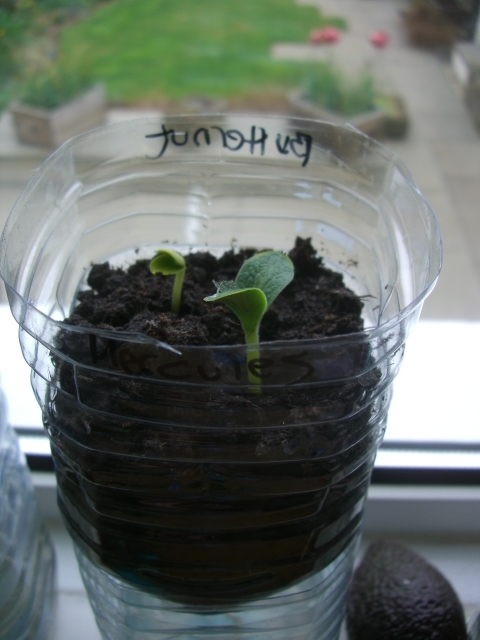 (If you are sowing cucurbits, for which these propagators are particularly good, sow the seed edge on so it doesn’t rot.) If you forgot to label the container earlier (as I always do! ), label it now. Water each planter well from the top on the first occasion and give it a nice tap to ensure any air pockets inside the soil collapse so that the string “wick” can convey water easily. Set in a sunny place and watch the seedlings thrive! When the first true leaves appear, nip the weaker of the two seedlings off at soil level with your fingernails or scissors to give the other all the soil nutrients. Don’t pull the seedling out of the soil as you risk disturbing the roots of the one you want to continue growing. Because the wick conveys water you can be quite reckless about abandoning your plants for seven days or more, and as long as you don’t fill to the top with soil, the clear plastic creates a nice, warm, breeze-free microclimate that supports squashes, pumpkins and cucumbers for their first few days of growth – after than they crawl out of the planter and take over the windowsill, so hearty are they!